Evening talk with art lovers at the ARTROM ‘HOME’ Gallery in Rome. Katrin Alvarez is a high-profile artist known for her compelling paintings that represent the complexity of human situations. Alvarez started as a journalist, going in-depth into the writing profession, but along the way she taught herself the art of painting, influenced and inspired by Michelangelo and Brueghel. Alvarez developed a deep relationship with nature and animals starting at a young age — an experience that has influenced her works of art. She discovered her talent when she found that she could create a colorful and imaginative world of her own by drawing and painting. Her mother was a natural artist who worked as an art teacher and architect. Alvarez’s works are the perfect blend of expressionism and surrealism. Her paintings are troubling and provoking yet soothing, intimate and sensitive yet bizarre, upsetting yet blissful. The compelling and transcendent imagery in her art have their own forms of teaching, evoking an array of emotions in the viewer. Her masterful use of color and light and skilled knowledge of the human figure allows for perfectly balanced compositions that expand the perceptions of her audience, creating room for each individual to form varied self-interpretations of the art. Alvarez produces pieces of unique technical approaches, depending on the subject matter. Her work is based on emotions and entirely influenced by her personal judgments and opinions. Her work is surreal in the sense that she distorts reality, enhancing it with her own personal observations and focusing on what is hidden in human reaction. Her most acknowledged paintings include the “Borderline”, “Different Worlds”, and “Trauma”. Her pieces are illustrations of inner emotion. Alvarez feels inspired by her own reality, which she allows to crash land and connect with her imagination. She says her mind is full of stories, dreams, desires, and fears that trigger her works of art to keep progressing. Addicted to colors and shapes, she puts them to use with the human face — distorting common views with her own perspective. The viewer finds in her narrative the love and compassion that only one who can truly understand is able to offer and present to the world in the form of masterpieces created and delivered from a divine source of inspiration, transcending the barriers of human limitations that the ego imposes on each one of us, and reaching out to the highest and innermost places of one’s being. A sense of oneness is evident in Alvarez’s works, which leave a lot open to interpretation, evoking emotions and creating for the viewer a unique and unforgettable experience. There are many symbols in Katrin’s work, which motivates her to create stories on canvas. More recently, she has blended technology with the old because of the influence of the cyber world on our day-to-day lives. It seems as though Katrin Alvarez’s art shows us how to look at the demons that each one of us harbors, so we can transcend any threats and arrive at the realization of self-acceptance and self-love. 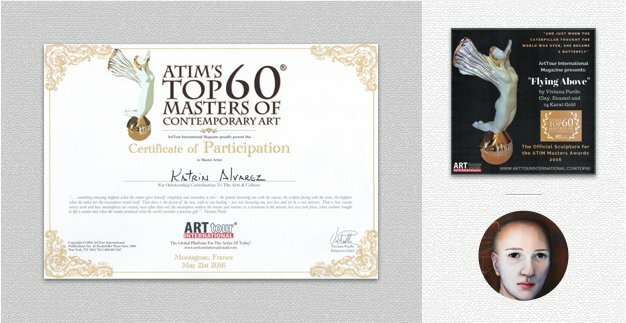 Alvarez is an internationally renowned artist whose works have been exhibited all over the world. She has received many awards for her paintings since 1968, including The First Group show in Cologne in 1968, Art Basel in Switzerland in 1978, and Agora Gallery in New York in 2004, among others. In 2007, her piece Exorcism received the Allan Edwards Award – Painting On the Edge. In 2009, she received the Vivid Arts Network Award at the Museum Castello Estense, and a Leonardo Award for Applied Arts in which she was given first prize in 2013. In 1972, she received an award for her first solo show in Cologne, and in 2012 she came out with yet another celebration in Vienna. The rare gem that is Alvarez’s art is shown through the paintings she creates with vibrant color, color used to make common objects reveal new and hidden dimensions of the space they occupy in life. She captures the imaginations of people when they observe objects and interweaves these concepts together into one painting, leaving many marveling at her work. This is one of the many reasons for Alvarez’s numerous and loyal following. All who have experienced her work do so with gratitude. To learn more about this fascinating artist grab a copy of the ATIM’s Top 60 Masters Of Contemporary Art 2016 at Barnes & Noble near you.